This week's EtsyInspired artist is Opal from Opalescence. How cute is that name really? Come on, I love plays on words! She was recommended by my friend and EIC player Carole. Opal spins the most BEAUTIFUL yarn I've ever seen! The colors are rich and gorgeous. And just look at that texture. Oh la la! If I could knit, I would definitely buy some of her yarn! Also, if you see something you love, you better buy it now since all of her fiber is hand dyed and each yarn is one of a kind. 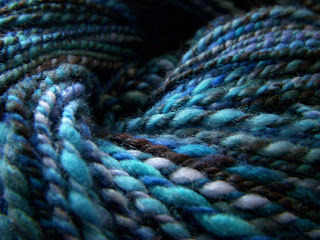 I would LOVE to see this yarn turned into a sweater or scarf, just stunning! Opal also makes different sized stitch markers, earrings, bracelets and pendants. 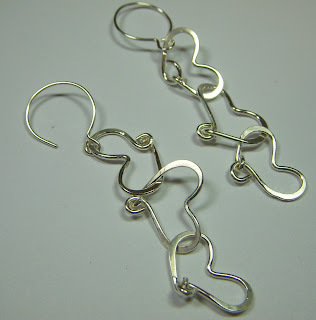 This week, Opal is giving away these amazing earrings valued at $28! She made everything, even the ear wires by hand! What a talented lady! Opal is also offering FREE shipping to all our blog readers with coupon code "heart hugs" until May 10, Mother's Day. If you'd like to win the earrings, just go to the Opalescence shop, choose any of her beautiful creations to be inspired by and make something. Post a link to your creation right here on this post by next Friday, May 1 at noon Pacific time to be entered in a random drawing to win. Also, remember that May 1 is the deadline to be finished with ALL the EtsyInspired challenges for April if you would like to be in the design team contest. Just complete all FOUR challenges for the month of April. I will post a blog entry next Friday asking who would like to be entered for the DT spots, leave a comment there. One permanent design team position and the guest DT member for June will be chosen from those applicants! You still have time! Go be EtsyInspired! Here is my card for the week. It is inspired by the amazing Aubergine Wensleydale Handspun yarn and this Butterfly Stitch Marker. I used the shades of purple from the yarn, the butterfly from the stitch marker, and also the little purple pearls from the stitch marker as my inspiration. This is Unity's Butterfly Beauty set. Ashley this is just fabulous and love the colors. Wow there are some beautiful items in this Etsy Store. Your card just turned out amazing I think it is totally gorgeous!!! So so so pretty and I love those papers and those colors are gorgeous!!! You knocked this one out of the park girl!!! I can't believe I am the first one this week... woot woot!!! My etsy inspired cardThanks Ashley!!!! love the store and the card! 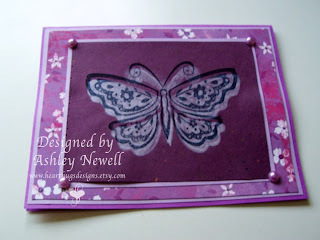 This is really pretty Ashley...love that butterfly! Thanks for another great shopful of inspiration! That is gorgeous, Ashley!! It's going to be hard to choose just what to be inspired by in Opal's shop. Her creations are truly wonderful. Sooooo pretty! Your cards ROCk the Etsy! Too bad you can't win. :-( Your designs are award winning for sure! Love those earrings... didn't see those earlier! Thanks Ashley for this wonderful wonderful challenge you created! looove the colors of your card, it's fabulous! What an absolutely gorgeous butterfly!!!! So fun this week!! I love this shop! ok, here is mine. I want to be on the dt!! here is my card, great store!! Here is my card, Ashley! Thanks for another great challenge, girl! Best of luck choosing your new DT members - it's gonna be tough! !